Beautiful certificate from the Caxton Society, Incorporated issued in 1911. This historic document has an ornate border around it with a vignette of the company's name. This item has the signatures of the Company's President and Secretary and is over 97 years old. 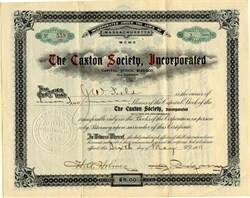 The Caxton Society was a co-operative publishing society, founded in January 1907 and incorporated on April 1910 under the laws of the state of Massachusetts with authorized capital of $125,000.